I went to a meeting in Williamsburg, Brooklyn last Friday. After a tough subway ride, this macramé extravaganza greeted me after climbing the stairs on my tired old knees. Of course, it just warmed my heart to see this. Maybe it was left over from a Halloween party. Once again, we have shades of hippie days long gone, or are they? What interesting serendipity considering my post on the same day. It is time for me to leave Brooklyn both figuratively and literally. I will be climbing into the cab of a U-Haul truck on Friday, May 9. I am heading for the left coast to beautiful San Diego. It is not far from that other macramé hanger in Orange County. Let us hope this is not some kind of macramé renaissance. Pray! It would benefit mainstream society, the poor in particular, that we move consumer horticulture into the 21st century rather than serve a few who choose to live in an imaginary past. 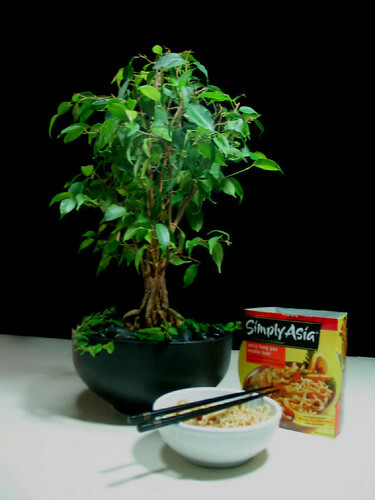 Both Ficus bonsai style plants are growing in recycled containers. The one on the left is growing in potting mix, the one in the right in expanded clay pebbles. In addition to learning how to grow plants in sub-irrigated planters (SIPs) with potting mix, we will also cover growing in expanded clay pebbles at the Brooklyn Botanic Garden SIP workshop on Wednesday. Both methods are simple forms of hydroponics that do not require electricity and air pumps. Can you identify the containers recycled into planters? Both of these plants were propagated from cuttings bundled together. You can see the small cable tie on the hydroculture plant. The soil plant cuttings were wrapped with a small strip of duct tape. Eventually the cuttings will meld together into one trunk. The only cost for these plants was the cost of the media. Everything else is free. For sure, the "drain hole people" do not like you knowing about this. This cactus lives in a clay pot but it grows in a sub-irrigated planter (SIP aka erroneously as "self-watering") insert (note plastic rim). It was a 2" pot size plant a little over five years ago. It has spent most of its time on a windowsill here in my Brooklyn apartment and more recently on a light garden shelf. The can is a scale figure. This cactus has been thriving in my Brooklyn apartment expect for one thing. The plant is healthy but note the brownish ring about half way up. It was caused by a gross operator error (by me). Contrary to what most people might think, it was not over-watering. Can you guess what caused it? I forgot to water it for 3 months! It was growing on a windowsill hidden by one of my light gardens. It sort of went into winter hibernation, using little or no water from week to week. When I discovered my goofup the top of the plant had turned brown. As it grew, the brown top became a brown ring. Lesson learned! Even cactus plants need water when they need it. See prior photos of this cactus in this Flickr photo set. If you are not familiar with hydroculture, (German - hydrokultur) it is a close cousin to sub-irrigation. Instead of growing indoor houseplants in solid media that mimics natural soil (peat, or coir, bark, perlite) the solid media in hydroculture is clay in the form of pellets or balls. Hydroton is the most widely (perhaps only) brand distributed in North America. Unfortunately we have no clay pebble kilns in North America. All of it is shipped from Europe. All of the plants in the promotional video (below) for the German company Gärtner Gregg (Gardener Gregg) are growing in hydroculture. Hydroculture is widely used in the Netherlands and most of Europe. The second video in German demonstrates how to convert a plant from soil culture to hydroculture. Anyone can do this. I have converted hundreds of soil grown plants to hydroculture with very little damage or loss. It is well worth doing. Note the water level indicaters in both videos (the plastic tube sticking up). Rather then spending $3-5 for a float indicator, you can use a simple pipette method (click photo to enlarge). It costs next to nothing and is very simple to use. If not for the fact that soil is the predominant media in the U.S. and a need to be relevant to this market, all of the plants in the CuGreen indoor plant lab would be growing in hydroculture. It is a simple-to-use, hygienic and sustainable method. There is no end of life for clay pebbles. You can leave them to your children…along with the plants you grow in them. Just like sub-irrigation, hydroculture is a simple form of hydroponics that does not require pumps and electricity to oxygenate the water (nutrient solution). Oxygen is introduced into the media from the ebb and flow design of the system. As the water level in the media goes down, the oxygen supply goes up. Air replaces water. Similar to SIP watering let the water level go down to empty or almost empty before refilling. It’s that simple. Green house growers all around the world use a similar method called ebb and flow irrigation. The plants, sitting on watertight benches or on a concrete floor are flooded periodically. The water drains after a short period of time, is stored and recirculates at the next flooding interval. Some of these systems use capillary matting. With these systems, there is no run-off or wasted water as in traditional overhead irrigation. 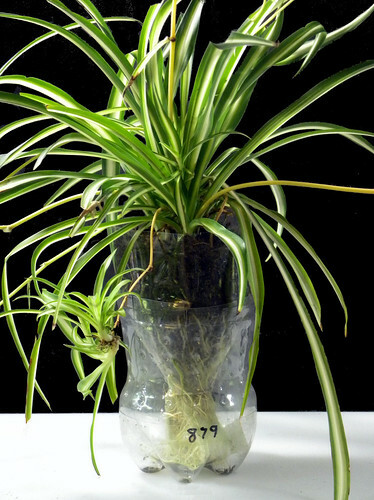 The U.S. houseplant industry is not likely to convert to hydroculture growing so you need to do it yourself. I believe there is a business opportunity for a wholesale distributor to provide hydroculture conversion as a service. 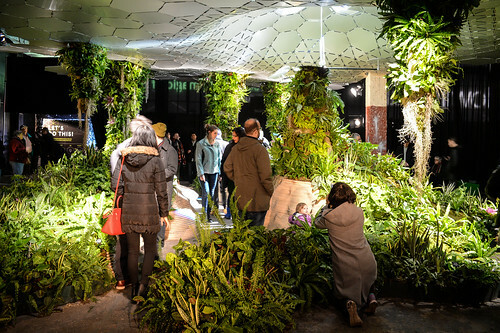 I have thought many times of doing it as a retail service in a new form of modernistic indoor plant store. The plants wouldn't be the cheapest. They would, however, be of the highest quality, easiest to maintain and affordable for a majority of the market. They would be particularly attractive for those who think they have a black thumb.